Set against the dual backdrop of World War I and the devastating 1918 influenza epidemic, ‘The Last Town On Earth’d is a brilliantly drawn tale of morality and patriotism in a time of upheaval. Deep in the woods of Washington lies the mill town of Commonwealth, a new community founded on progressive ideals, and a refuge for workers who have fled the labor violence in the surrounding towns. When rumours spread of a mysterious illness that is killing people at an alarming rate, the people of the uninfected Commonwealth vote to block all roads into town and post armed guards to prevent any outsiders from entering. One day two guards are confronted with a moral dilemma. A starving and apparently ill soldier attempts to enter the town, begging them for food and shelter. Should the guards admit him, possibly putting their families at risk? Or should they place their lives above his and let him die in the woods? The choice they make – and the reaction it inspires in their town and beyond – sets into motion a series of events that threaten to tear Commonwealth apart. 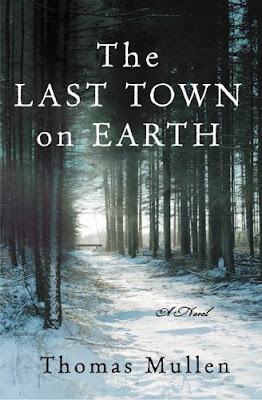 A sweeping cinematic novel, ‘The Last Town on Earth’ powerfully grapples with the tensions of individual safety and social responsibility, of moral obligation and duty in the face of forces larger than oneself. Thanks for this great review and getting this book on my radar. I found your blog on GoodReads as I'm looking for models in starting my own. Thanks!